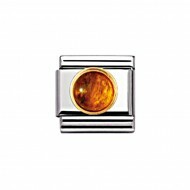 Composable Nomination Classic Gold and Natural Hard Round Stones Amber Charm, a stainless steel base link with 18ct Gold and natural hard round stones. 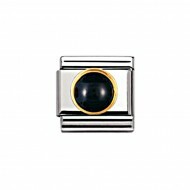 Composable Nomination Classic Gold and Natural Hard Round Stones Black Agate Charm, a stainless steel base link with 18ct Gold and natural hard round stones. 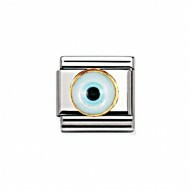 Composable Nomination Classic Gold and Natural Hard Round Stones Greek Eye Charm, a stainless steel base link with 18ct Gold and natural hard round stones. Composable Nomination Classic Gold and Natural Hard Round Stones Green Agate Charm, a stainless steel base link with 18ct Gold and natural hard round stones. 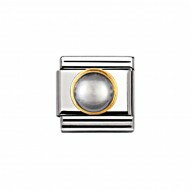 Composable Nomination Classic Gold and Natural Hard Round Stones Grey Pearl Charm, a stainless steel base link with 18ct Gold and natural hard round stones. Composable Nomination Classic Gold and Natural Hard Round Stones Lapis Lazuli Charm, a stainless steel base link with 18ct Gold and natural hard round stones. Composable Nomination Classic Gold and Natural Hard Round Stones Moon Stone Charm, a stainless steel base link with 18ct Gold and natural hard round stones. Composable Nomination Classic Gold and Natural Hard Round Stones Pink Coral Charm, a stainless steel base link with 18ct Gold and natural hard round stones. Composable Nomination Classic Gold and Natural Hard Round Stones Pink Pearl Charm, a stainless steel base link with 18ct Gold and natural hard round stones. Composable Nomination Classic Gold and Natural Hard Round Stones Red Agate Charm, a stainless steel base link with 18ct Gold and natural hard round stones. Composable Nomination Classic Gold and Natural Hard Round Stones Red Coral Charm, a stainless steel base link with 18ct Gold and natural hard round stones. Composable Nomination Classic Gold and Natural Hard Round Stones Red Opal Charm, a stainless steel base link with 18ct Gold and natural hard round stones. Composable Nomination Classic Gold and Natural Hard Round Stones Turquoise Charm, a stainless steel base link with 18ct Gold and natural hard round stones. Composable Nomination Classic Gold and Natural Hard Round Stones White Mother of Pearl Charm, a stainless steel base link with 18ct Gold and natural hard round stones. Composable Nomination Classic Gold and Natural Hard Round Stones White Pearl Charm, a stainless steel base link with 18ct Gold and natural hard round stones.